“Those pretend people you shoot at in computer games . . . now you know. They think they’re real. They feel it.” Way to ruin the fun for everybody, Doctor Who. 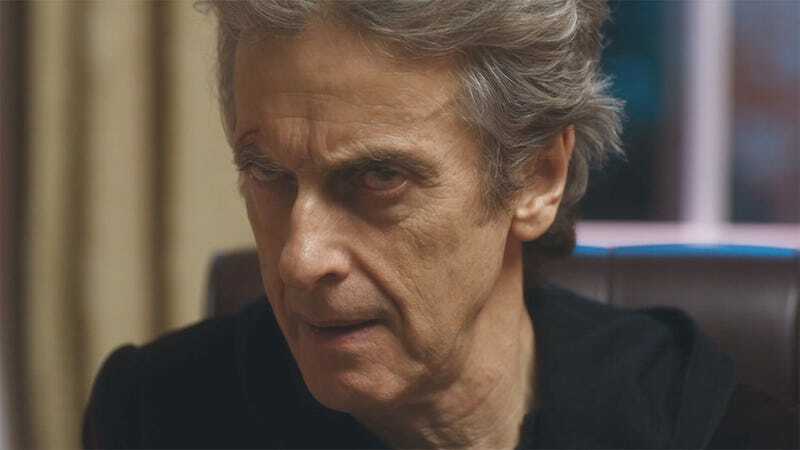 “Extremis” is the latest episode of Peter Capaldi’s final season of the BBC’s long-running science fiction series. In it, the Doctor and his companions are tasked with unraveling the mystery behind “Veritas,” an ancient text that cause people to commit suicide after reading it. The Doctor, Nardole and Bill (whose first date with a nervous young woman is interrupted by the Pope, of all people) embark on a world-spanning adventure that takes them to the Vatican, the Pentagon and CERN, or so they think. In actuality, the world they’re in is an elaborate holographic simulation created by an alien race as a means to test drive an invasion of Earth. The people reading the “Veritas” discover the truth behind their existence. As the Doctor explains to a distraught Bill, it causes a rather extreme reaction. A chilling sentiment in a very strange episode of what’s turning out to be Peter Capaldi’s best season as the Doctor yet. It feels like the writers and cast are really making sure we feel the full force of his departure from the role at the end of the series. It’s working, dammit. You can read a full, spoiler-rich synopsis of the episode over at our sister site, io9.